Welcome to the 35th edition of the Carnival of Divided Government- The Special Broken New Year Resolution Edition. Only ten days into the 'Tens, and DWSUWF has already broken two, maybe three, maybe ten resolutions. This Carnival was promised as a special New Years Day Edition January 1, then as a Special Hangover Edition on January 2. Yeah... well... that just wasn't going to happen. We also privately resolved to post every day for the first few weeks of the year, just to see if we could find some blogging discipline in the new decade. Yeah... that didn't happen either. 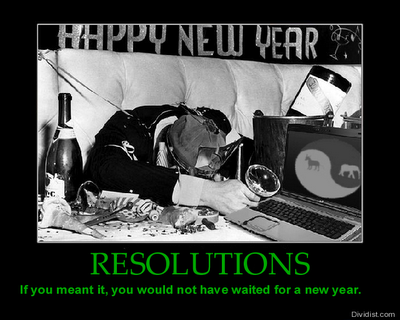 So we are up to at least three broken resolutions, or depending on how we count them - ten. Small comfort, but whatever the number, we are still doing better than the Obama administration. As noted administration critic Nancy Pelosi quipped when referring to President Obama: "There are a number of things he was for on the campaign trail". Indeed, Madame Speaker, there was. She was responding to a question about just one of the things that candidate Obama was for then, specifically - transparent health care negotiations televised on c-span, which... he is apparently not for now. This is par for the health care reform course, since Obama also claimed to not have campaigned on the public option, except he did, and he was completely against taxing health care plans, until he was for it. But that is just health care reform. Candidate Obama promised "Sunshine before Signing", saying he "would not sign any nonemergency bill without giving the American public an opportunity to review and comment on the White House Web site for five days." He kept that promise until... well... never. The sunshine on his very first bill, the Fair Pay Act, was obscured by the clouds of political expediency. It passed on January 27, 2009, was signed on January 29, 2009, and only then posted on the web. Similar cloudy politics kept the sun away from the S-Chip bill, the Credit Card Bill of Rights, and of course, the stimulus bill. Then there was the promise "...absolutely, we need earmark reform. And when I'm president, I will go line by line to make sure that we are not spending money unwisely." Now, to be fair, he may not have broken that promise. Sure, he signed an Omnibus spending bill in March with around 9,000 earmarks, and then he signed another one in December with 5,000 more, but, I think we can give him the benefit of the doubt on this promise. He probably did review each earmark line by line and we can rest assured that each was money well spent. As explained in earlier editions, we have adopted Latin ordinal numeration to impart a patina of gravitas reflecting the historical importance of the series. In this the Carnival of Divided Government Triginta Quinque (XXXV), as in all of the CODGOV series, we select volunteers and draftees from the blogosphere and main stream media writing on the single topic of government divided between the major parties (leaving it to the reader to sort out volunteers from draftees). Consistent with this topic, the primary criteria for acceptance in the carnival is to explicitly use the words and/or concept of "divided government" in submitted posts. A criteria that, to our endless befuddlement, is ignored by many of the bloggers submitting posts, which sadly results in DWSUWF reluctantly ignoring their fine submissions. "A wide majority, 68 percent, of those polled in the George Washington survey said they disapprove of how Congress has handled its job. But voters are split on whether they would prefer a divided government – with Republicans controlling Congress and President Barack Obama in the White House – or a unified government. Forty-one percent said they preferred a divided government, while 38 percent would choose a united one." Hmmm. We have work to do and miles to go before we sleep. "The world economy shuddered last week as a rating company downgrade of Greek debt set off fears of default. Investors decided to beware of Greeks bearing bonds, and markets stumbled... If the current Greek budget outlook proves to be accurate, then its deficit over this year and next will average a whopping 10.9 percent of gross domestic product. Small wonder that investors headed for the exits. A deficit that high could easily turn into a fiasco. As bad as that picture is, it’s worse in the U.S. Our deficit this year, according to the latest estimate from the Congressional Budget Office, will be 11.2 percent of gross domestic product... Last week’s House budget vote suggests that the current spending trend will continue. If so, there are two likely endgames. The first is a takeover of at least one branch of Congress by Republicans. Divided government created a political dynamic that delivered budget sanity when Clinton was president, and it might do so again. Given the failure of both Republicans and Democrats to govern sensibly as the dominant party, divided government may be our only hope. In the second scenario, Democrats continue to rule as they currently are. Anyone who wants to understand better where that will lead should call up the Greeks." A faint hope, but hope nevertheless. "Politically, 2010 is going to be a very interesting year to watch. For libertarians, the best hope is divided government and a Republican party that rediscovers its primary principles and decides to live up to them. I think we’ll get the divided government. However, my concern is the midterms will see enough Republicans elected, despite themselves and their lack of a principled stand, that the important message about principles will continue to be lost on them – again. That will result in a Senate not much different than we have now, where compromise and collegiality are more important than principle and the people. That means big government, more spending and more deficit. And that means Republicans will remain the minority party and out of the White House in 2012." I am even less optimisitic than McQ. The GOP has just dug too deep a hole to crawl back out in one election cycle. It would take an extraordinary shift for the GOP to regain a majority in either house in 2010. But if Republicans make up ground in 2010 as seems likely, it is a foregone conclusion that they will at least retake the Senate and possibility the House in 2012. In that case, I would just as soon see the Republicans lose the White House. 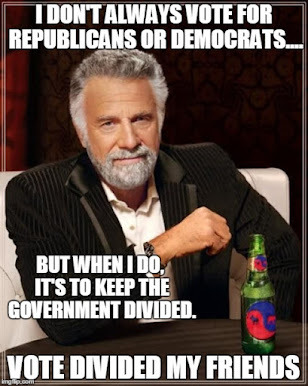 Divided Government is always better than Single Party Rule, regardless of whether it is the Democrats or the Republicans. And there is nothing that serves as a better reminder to Republican legislators of core principles, than a Democratic President. "Any electoral calculus at this point is as meaningless as all the chatter we saw a few months ago about how Democrats were going to pick up additional Senate seats from retiring Republicans, but at very least, the Democrats can kiss their super-majority goodbye. The House on the other hand is looking like it could very well pass back into Republicans hands. Ah! 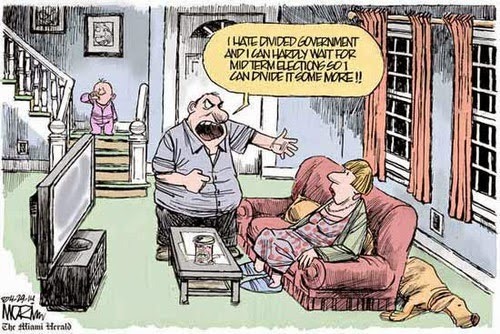 Divided government. My favorite." Mine too. But, like many, Anne/Dave/Mick/Mark may be underestimating the extraordinary difficulty of flipping a majority in the House. With representatives enjoying over a 95% re-election rate in most years, it takes a tsunami to flip the House. Why? Gerrymandering is a major factor, combined with the tendency of voters to like their own representative, no matter how much they despise Congress. Counter-intuitively, it is easier to flip a majority in the Senate than the House, despite only 1/3 of the Senate being up for re-election every cycle. This is evidenced by the 100 Year Rule - Since we started directly electing Senators over 100 years ago, no House of Representatives has ever flipped a majority, without it happening first or simultaneously in the Senate. It could happen as it did in 2006, but I just don't see that kind of groundswell in 2010. Although, if AJ Strata is right, this Public Policy Poll may be an early tsunami warning. "If government that governs the least governs best, which sounds very likely, and the branches of government are supposed to check each other, we are best served with divided government. That is, if there is a Democrat in the White House, another party should at least be in control of one house of Congress. If the Republicans just let it happen, Congress is theirs in 2010. Unless they screw up." By "screwing up", Kelly means GOP establishment driving libertarian factions from the party with ideological purity tests. It is sort of the same concern as McQ, but sideways and inside out. "The bottom line is this: The filibuster is as American an institution as the Senate itself. Our republic -- miraculously, liberal Democrats and ultra-conservative Republicans would argue -- has survived more than two centuries of the filibuster. While the filibuster is not in the text of the Constitution, its legislative history demonstrates that its principle is equally as old. Read the Federalist Papers. Read the text of the actual Constitution. The American system is one of divided government -- federalism, three branches of government, a bicameral federal legislature and yes, the 200-year-old filibuster -- putting a premium on the rights of the political minority." It should not seen that hard to understand, yet ignorance of the history and intent of the founders and architects of our Constitution is epidemic. James Madison's deep insight into the reality of human nature in government, and his explanation of the need to pit ambition against ambition in a government comprised of men who are not angels as explicated in Federalist #51, should be required reading for all Americans. My favorite phrase to describe our Constitution and government was coined by historian Joseph Ellis - "The enshrinement of argument". When Congress serves as a partisan lapdog to the Executive, as it did under the first six years of the Bush administration and as it is doing now, our government is not working as it was designed. "A favorite claim of pundits, which has made its way into the public awarness as an accepted political truism, is the claim that the government works best when it is divided – that the elected branches are controlled by different parties. The experience of the last few years seems to reinforce the claim – the notion that the disasters of the Bush era would not have happened if government had been divided, a Democratic Congress would have restrained the President’s war-making and forced him to not ignore Katrina, the coming economic storm and so on. By contrast, the 1990s saw a divided government, budget surpluses and the longest peacetime economic expansion in history. Examining the divided government thesis requires two separate efforts – first placing it in historical context and second examining the argument and its assumptions." * Reinforced Checks and Balances between the branches. Whether you consider divided government to be better government depends on whether you agree the items in this list represent "better" government. DWSUWF does. "The past 20 years have seen voters put a different party in the White House in 1992, punish Democratic overreach in 1994, re-elect Bill Clinton in 1996; put a different party in the White House in 2000, re-elect George Bush in 2004, punish GOP fecklessness in 2006; put a different party in the White House in 2008. At some point, voters will conclude that their pendulumism doesn’t discipline either party. Their short-term response, in D.C. and perhaps under Atlanta’s Gold Dome, may be a lunge toward divided government." While it is true that "pendulism" careening from single party Republican rule to single party Democratic rule, does not "discipline either party", the parties will and do discipline each other - just so long as neither has all the keys. "People just don't want this bill. I think the big mistake was skipping the step of winning public support for a particular plan. It wasn't enough that people believed there was a problem. People needed to believe the solution wasn't worse than the problem. We were supposed to look away and trust them. The trust was never won, never earned. It's been a horrific mess, and it just looks messier and messier as time wears on. Obama kept his distance, which looks pretty smart now. Easy to see why the congressional Democrats are pissed at him now. Good! I like divided government." "By showing a willingness to get in there and mix it up, the whole debate might have taken on a cooperative feeling to it. Instead by letting very uncharismatic, and already unpopular, Democratic leaders take the forefront, this bill was forced to be ramrodded via all sorts of backdoor and horribly partisan measures." An excellent lesson in how real, open, and partisan debate in a divided government would have resulted in a better bill with greater acceptance from the governed. It could hardly have done worse. Oh - and BTW, I would be a great deal more receptive to Ms. Althouse's declarations of affection for divided government, if she had not voted against divided government. "The best you and I can hope for in the immediate future is that the Democrats will lose control of Congress, resulting in divided government. Things were better in the 90s when one party controlled the White House, and the other controlled Congress. But while divided government is better than one-party rule, it's still not good enough." Right. Not good enough, but one hell of a lot better than the situation right now. To point out the obvious, we don't have divided government right now, and there is a pretty poor likelihood of getting even to that state before 2012. So, while I think you guys are doing god's work taking on Leviathan, and I'll probably even send you a few bucks, perhaps - in 2010 - you should think about moving the re-election of divided government to the front burner. It is sure not a gimme, every additional voice could help, and it is the one thing that could be accomplished in 2010 that would make a real difference. The aphorism that a journey of a thousand miles starts with single step is one you should seriously ponder right now. "Dear Obama, your job is to lead. You have failed. So has Senator Reid. And then brag that we’ve got what we need. Yes, you’ve tragic’ly blown your great chance. So spare us the song and the dance. I am sorry — the prez has no pants.."
Despite politics at considerable divergence from our own, Madeleine is a DWSUWF favorite, and has made numerous appearances as the CODGOV off-topic pick. We keep hoping these links will inspire her to compose a Divided Government limerick someday. Although we intend to pick up the Carnival pace in this election year, DWSUWF will be out of the country for most of April. So look for the next edition of The Carnival of Divided Government triginta sedecim (XXXVI)- Special Ides of March Edition on or about 03-15-2010. Submit your blog article at carnival of divided government using our carnival submission form.